From Ager to Vilafranca de Conflent, from Agramunt to Valls, from Besalú to Tortosa, the Jewish communities were a fundamental element of development and culture in the Catalonia of the Middle Ages. Our story would not be complete without his. 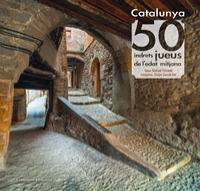 This is the key and the starting point of the new book by the poet and Hebraist Manuel Forcano, Catalunya, 50 indrets jueus de l'edat mitjana, which with these pages pays homage and recalls the times when our country was a place of coexistence and confluence of cultures and traditions. All large, all important, all essential.